half string made their first noise in the summer of 1991. Friends since high school, Brandon Capps and Tim Patterson shared a penchant for obscure post-punk records that few others in Tempe, Arizona were even aware existed. The pair slowly built their music collections via weekly visits to Stinkweeds Records and recommendations from its owner, Kimber Lanning, who had opened the local indie/import record store at the age of 19. Upon learning that Kimber's father was a jazz drummer, Tim and Brandon devised a plan to borrow a drum kit, clear their living room, and invite her over to have a go. Kimber initially declined, insisting she didn't play the drums, but the scheme eventually worked and the three began meeting up to explore new sonic possibilities. The following summer, Kimber and Brandon took a trip to Los Angeles and stopped by Independent Project Records to hand deliver a demo tape to label owner Bruce Licher. When they returned to Arizona, there was a postcard from IPR waiting in the post box; Bruce wanted to release a 7? of the recordings of ?Eclipse,? ?Maps for Sleep,? and ?Arc-fold,? as is. The release of a proper record on a label they admired felt like an ultimate sign of the band's existence. At the beginning of 1993, Matt Kruse joined half string on second guitar. Matt and Brandon became acquainted over a long evening of no talk and all guitars, sealing a pact to add another layer of texture and melody to the band's evolving sound. This would be evident on ?Oval,? the band's first single featuring the expanded line-up, and the subsequent Tripped Up Breathing EP. half string began to gig regularly at local music and art venues. (One memorable bill included a performance artist who melted chocolate bunnies with a blowtorch before having skivvies soaked in dirty water thrown at his head.) Other bands and musicians looking to break with the commercial ?desert jangle? sound that ruled the local music scene began to appear. In an upstart, reactionary gesture sprang the first Beautiful Noise festival. Organized by Brandon with help from his bandmates, Beautiful Noise brought together nine Arizona-based acts to perform short sets; the running order was determined by drawing straws at the half string house. The ?festival of ethereal and difficult pop music,? as it was billed, took place on April 30th, 1993 at The Works, a local dance club known for sweaty all-night raves, not rock concerts featuring spacey guitars and fuzz boxes. Beautiful Noise became a name synonymous with the ?new Arizona music scene.? The event led to attention beyond the desert, including the bands soulwhirlingsomewhere and lovesliescrushing signing to Projekt Records and Alison's Halo to IPR. Moreover, other musicians (some of whom were festival attendees) were encouraged to adapt their 4-track-based music into live sets and start performing outside of their bedrooms. Tim Patterson parted ways with half string at the end of 1993. After a series of fruitless auditions, the group finally convinced Dave Rogers, who was already fronting his own band Chubby, to join on bass and backing vocals. The new lineup traveled to New York in the Fall of 1994 for a CMJ Music Marathon showcase that featured IPR alumni For Against. The East Coast trip also included two other dates, one with The Ropers in the packed basement of Art Monk Construction's label headquarters in State College, Pennsylvania. Interest in half string was growing outside of Arizona and across the Atlantic. Germany's Pop Goes On! coordinated a co-release with IPR that compiled the Eclipse and Oval singles, along with 3 unreleased tracks onto one CD. Eclipse/Oval/Hue was released at the beginning of 1995 and would find itself on Big Takeover magazine's Top 40 list with a glowing review from Jack Rabid. half string continued to perform often, and opened for Oasis, Wedding Present, Medicine, and Legendary Pink Dots on their Arizona tour stops. The group organized the second Beautiful Noise festival, which took place in Phoenix and Tucson in February 1995, and hosted All Fish Go To Heaven, a two-day pop festival that Fall that featured the Beautiful Noise bands plus non-Arizona bands including Apples in Stereo, Dart, Aberdeen, For Against, Jupiter Sun, and Super 31. The band members began offering their creative services to other groups. Brandon played second guitar with Scenic, Dave played bass with Alison's Halo as well as fronting his own Introspection Trio, and Kimber played drums with Six String Malfunction. In December 1995, a one-off gig of ?unplanned music? was booked using the moniker Watching The Hydroplanes (a tribute to Tunnel Vision's obscure Factory Records 7-inch single). For the set, Kimber played drums, Matt guitar, and Brandon took on bass duties with the aid of an eighties-era analogue delay pedal that had been modified as a noise generator. 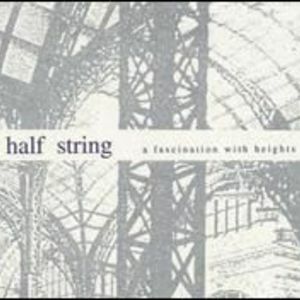 half string's first and only full-length recording, a fascination with heights, was written and recorded in the Winter of 1996. Brandon's house was temporarily converted into a recording studio of sorts, and the band took six leisurely months to refine the album they had been waiting years to make. The band moved their practice space to Stinkweeds that summer, rehearsing after Kimber locked up shop. These sessions, as many previously, were recorded due to the band's tendency to improvise new songs more rather than practice already written material. The last songs they recorded (?honeycut,? ?sixties No.2,? and ?night sea journey?) were more along the lines of unfinished musical odysseys rather than pop songs (?honeycut? being the exception), and showed the band at ease exploring new territory. These final songs never got properly recorded in the studio. half string disbanded amicably in the summer of 1997, six years after their inception.